Looking back at the 33rd edition of the Americas Cup, the conclusion is one of mixed feelings. In disgust over the countless courtcases, fights, manipulation, postponements and enormous egos of the two owners of both syndicates. In awe of watching the magnificent display of technology and raw power of the BMW Oracle and to a less extent Alinghi. And full of enthusiasm when watching the actual race. That pretty much sums it up. Clearly, awe and enthusiasm have taken the upper hand during the last week. In that perspective it is sad to conclude that the 33rd Americas Cup will likely end up in the history books as one of the most controversial ones, very similar to the Americas Cup of 1988, when Dennis Connor won the cup with his Stars and Stripes. It is to hope that, again similar to what happened after1988, the 34th Americas Cup will regain some of its lost reputation, a big responsibility for the parties involved. Astonishing display of technology and yachtsmanship. Looking back at both races the image of a monster trimaran with a 68 meters high mast and a highly innovative 223 foot wing sail (easily exceeding the wing of a Boeing 747 airplane) will always be imprinted in the minds of those who have witnessed it. 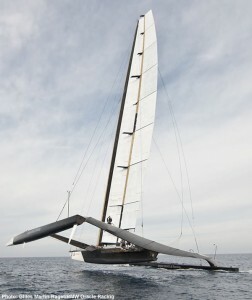 This wing sail was powering this unique piece of engineering equipment at three times the speed of the wind, sending its windward and middle hulls flying well above the water. These were the fastest, most technologically advanced sailboats built in the 159-year history of the America’s Cup. This giant boat made the crew like little midgets, of course safely guided by Jimmy Spithill at the helm. Talking about giants! Spithill, who at 30 became the youngest skipper to win the America’s Cup, has proven his great sailing abilities and absolute dedication (which even led him to take flying lessons). Russell Coutts is the other hero. The CEO of the racing team has done it again, he won his 4th Americas Cup and hasn’t lost a Cup race in 15 years. Moreover, being a true leader he sacrificed himself for the best of the team by not participating in the first race. So far for the positives….. Disgust over legal wrestling, manipulation and egos. The flip side of the coin is clearly that this Americas Cup will always carry a dark shadow of distrust, a lack of sportsmanship and enormous egos of both syndicate owners. The countless number of courtcases during the last 2 ½ years (and we haven’t witnessed the last one yet) has severely dented the credibility of the Americas Cup and the sport of sailing. Moreover, rumours have it that the SNG (the organizing yacht club) racing committee members refused to raise the flags and participate in the starting procedure of the last race, possibly following instructions of Alinghi. If true, it would be the ultimate of unsportsmanlike behaviour. Let’s hope this is not the case, but I would not dare to bet against it if I hear Alinghi owner Ernesto Bertarelli commenting: “They got a little help from the legal system in New York. That always makes things difficult for us Europeans to get the same advantages. It’s not the Europeans’ Cup; it’s America’s Cup. It’s very difficult for a European to win.” Such comments are childish and make you wonder how the guy has made his fortune. This brings me to the egos of the two owners, which are as big as their ……….enormous wealth I guess. Both business tycoons have prioritized their own ambition over the sport of sailing. Battle should take place on the water, not in court. Bertarelli seems to have the biggest ego. Rather than handing the wheel to his best helmsman, he wanted to steer the boat himself in the first race, showing his enormous cockiness. Moreover, he blamed Ellison to be not in charge of the BMW Oracle. By not helming the BMW Oracle, Ellison at least showed he is the better manager. From major to sideline event; disappointing economic impact. In contrast to the last edition, the 33rd Americas Cup has not been a financial and economic success. The buzz, the public interest, the teams and the business that was generated in 2007 have not been realized in this edition, which has not helped the Americas Cup brand. Both owners have spend around USD 200mln each on their campaigns, but it seems doubtful whether either will have a sufficient payback. BMW has already indicated they are not happy with this version of the Americas Cup and are re-assessing whether they will continue their support. From a sponsor part of view, it hasn’t been a success anyway. The mudslinging and the battle over every detail of the contest have driven away both sponsors and fans: the 2007 race attracted more than $200 million in sponsorship money, but the 2010 has pulled in just $11 million, whils the competition has certainly lost much of its charm. Only time will tell if the next competition will be able to attract as much interest as the series did back in 2007. In 2007 the Americas Cup was an enormous event; according to Professor Tom Cannon it even was the third-largest sporting event after the football World Cup and the Olympics in terms of gross economic impact. He emphasised that because of the lack of a challenger series, which last time attracted eleven challengers from nine countries along with major sponsorship opportunities, the overall economic impact was probably about one tenth of the 5bn euros ($7bn; £4.4bn) it was worth last time. The long-weekend event was not a draw for TV Companies or advertisers, with the races being shown on the Internet for the first time and the organising budget reduced from a record 230-million to just eight million euros for last week’s event! Additionally the host city of Valencia wasn’t happy either, in terms of what might have been. The 2007 event was a major attraction for tourists, sponsors, clients, business and the media bringing benefits of over two billion euros to the port and almost four billion euros net economic benefit for the city. This year, coverage on Spanish TV was very limited and with the event now finished, Carnival fiestas from Rio, the Canaries and around Spain totally eclipsed the couple of minutes seen about the America’s Cup. That sums it up and should be taken into consideration when organizing the next edition. In this perspective Ellison’s comments are encouraging. He is promising an independent organising committee including an impartial jury and umpires, for the next multi-challenger event, agreeing it is important that there is a level playing field for all competitors to bring sponsors and fans back to sailing’s pinnacle event. If Ellison and Onorato practice what they preach, there is hope for the next edition of the Americas Cup. Still being the oldest sports trophy in the world and one of sailing’s biggest traditions, it is the least they can do!